Orange County (established 1889) is one of the counties of California, in the United States. It is in southern California, along the coast of the Pacific Ocean. Its county seat and largest city is Santa Ana. The county has 3,121,251 people, spread across just 948 square miles (2,455 square kilometers). It is the third most populous county in California. The west-flowing Santa Ana River divides the county into north and south parts. On the north, the San Gabriel River forms its border with Los Angeles County. Some other big cities include Anaheim, Orange, Huntington Beach, Fullerton and Irvine. The county is mostly residential. The highest average income in Orange County is $203,091, in the city of Villa Park. Some famous attractions, such as Disneyland and Knott’s Berry Farm, are in Orange County. The tallest building in Orange County is the 37-story One Broadway Plaza, an unfinished building in Santa Ana. It will be 497 feet (151 m) tall when it is completed. 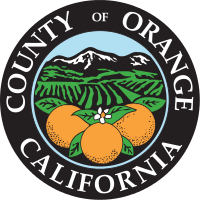 ↑ "Orange County Fact Sheet". Retrieved 2009-03-31.